collage on panel, 25" x 25"
collage on panel, 28" x 34"
collage on panel, 26" x 26"
Windham Wines and The Wine Gallery opened for business in the newly restored, historic Wilder Building early in December 2006. The Wine Gallery provides a casually elegant environment for gathering with friends to enjoy tasting wines from around the world, a variety of great beers, and light food meant to complement the wines featured by the glass. In addition, The Wine Gallery conducts Educational Seminars, which to date have included Wine 101, a four-part introduction to wine-tasting and varietals; and Wine and Cheese Pairings in collaboration with Ellen Ogden, author of The Vermont Cheese Book, and with Jeffery Roberts, author of The Atlas of Artisanal American Cheeses. Additional workshops scheduled for 2007 include an Olive Oil seminar with Deborah Krasner, author of The Flavors of Olive Oil; Beer Appreciation, a 3-part series with Travis Miller tasting various styles; Oregon Pinots, led by Winthrop Pennock; and Champagne and Sparklings, led by Marty Ramsburg. In early 2008, the Wine Appreciation series will be offered again, as well as seminars on Burgundies, sake, and coffee (by Mocha Joe's). In addition to seminars, the Wine Gallery offers Wine Tastings on the second and fourth Saturdays of each month, from 4:00 to 6:00. We have also hosted a variety of special events, including nonprofit fundraisers and donor recognition events. The Wine Gallery is open Tuesday-Saturday at 5:00. 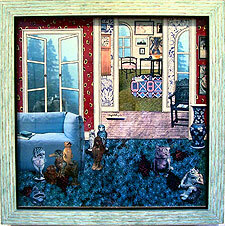 Mary Welsh is a self-taught artist who invented her collage technique while traveling and studying on a two-year sojourn in England and France. Extensive travel and work in the major art centers of Italy, Portugal, Spain, and Mexico have also informed her style. Her work has been featured in one-person and group exhibitions in galleries throughout the United States and abroad. She is a member of the Rock River Artists collaborative that hosts an annual Open Studio Tour in the Vermont villages of South Newfane, Williamsville, and Newfane each summer. The studio she shares with her husband, artist Roger Sandes, "looks like a tornado hit it," wrote Joyce Marcel for a Vermont Magazine article in 2001. "Magazines sit in tall piles on the floor. Pictures and cutouts are pinned all over the walls. The tables are crammed with paint and other artists' materials. 'My section of the studio is a toppling edifice,' Welsh says, laughing. 'I have been collecting paper for close to thirty years. . . . It used to be in files, but now it's just gotten out of control.'" 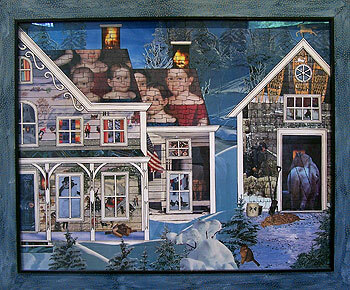 Mary talks about her work in this Artist Statement : "My collages are depictions of what we all take for granted -- houses, rooms, and their contents. Viewing these scenes evokes memories and fantasies of what we know about houses and rooms, and these memories and fantasies become incorporated in our experience of the work. Some things are exactly what they appear to be, some things are not. These dwellings, their settings and contents, reveal the layers of mystery surrounding the lives of all of us. I use found materials placed in new contexts to ask questions about appearances and reality, and to stimulate our imaginations about new possibilities." Welsh's collages are made of found materials from art magazines, art books, calendars, and end papers which are glued with acrylic medium (acid free) on birch or mahogany plywood panels that have been prepared with acrylic gesso. The work is sealed with eight coats of clear acrylic varnish. 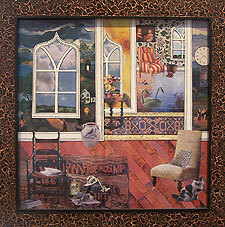 The frame moldings are of a custom design manufactured exclusively for these works, and each frame is hand-painted with acrylics in patterns and colors suited to the particular collage. The back of each work is sealed, and the front is protected with ultraviolet-filtering plexiglass. 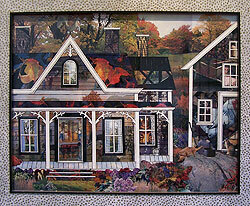 Visit The Wine Gallery during November and December to see Mary's fascinating and evocative collages. 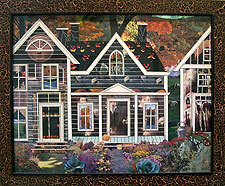 She will be on hand during Gallery Walk, November 2, from 5 to 8:30 to talk with visitors about her work.